Are you engaged and dreaming of having a romantic and unforgettable beach wedding? Are you looking for the perfect accommodations to have a special event? 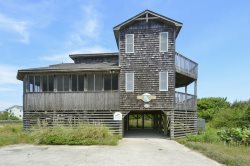 Let us help you find the perfect Outer Banks event home from our selection of vacation rentals that span from Corolla to Nags Head. The Outer Banks of North Carolina are a chain of barrier islands that are highly regarded and visited by tens of thousands of vacationers each year, with summer being the most popular time for travelers to come. Not only is the Outer Banks or OBX a popular spot for residents from the eastern portion of the United States to unwind, the barrier islands are also considered to be one of the most popular spots for destination weddings. In fact, many prominent publications put the Outer Banks in their top five list of destination wedding spots! Probably one of the best parts about getting married or having a special event on the Outer Banks is that you can combine ceremony, reception or event into a vacation for you and your guests… How thoughtful of you! Next time you or your company is planning an off-site workshop, think of Seaside Vacations as your go-to resource for finding the perfect OBX event home. Select homes managed by Seaside Vacations have been designated as “event homes.” These homes are available to host your special event (wedding, reunion, business gathering, etc.). Written permission from both Seaside Vacations and the owner of the home is required. An event fee and additional security deposit may be required. Event home rental includes a $2,000 event fee and $1,500 refundable deposit.